Omnivores and vegetarians alike can agree: Dry beans are an excellent pantry staple. A cup of dried beans costs only a dollar or so; simply soak them overnight, cook for about an hour or until tender, and they magically double into two cups. Armed with two cups of protein-packed beans, you can make almost anything. In these cold winter months, when there is little fresh produce available, celebrate fiber and mineral-rich dry beans in your kitchen. 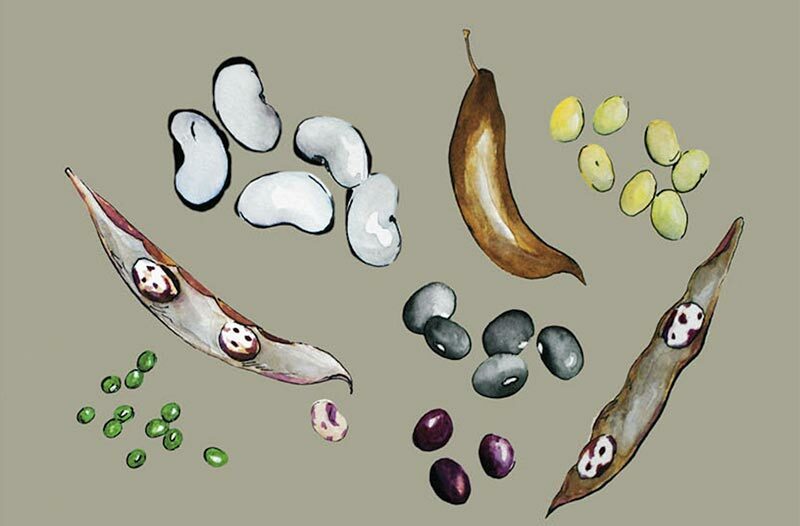 The next time you’re in the bulk aisle at the grocery store, explore the different varieties of dry beans. Look for garbanzos (chickpeas), black-eyed peas (cowpeas), kidney, black, navy, and pinto beans. If you’re not sure which is your favorite, try buying a small amount of each, cooking them, and mixing them together with chopped scallion, carrot, celery, and a simple vinaigrette for a bean salad. For an even quicker meal, buy already cooked beans in BPA-free cans with no added sodium. There are many ways to incorporate beans into your weekly cooking rotation. Cook a big pot of garbanzo beans and use half in the blender with tahini, olive oil, salt, and lemon to make hummus. For a quick weeknight dinner, roast the other half of your garbanzo beans with chopped broccoli, onion, red pepper, ground cumin, and garlic in a 375° oven for 20 minutes, and then load the contents into whole wheat wraps with a little bit of cheese. A big pot of French lentils can be used throughout the week on top of salads or soups, or sprinkled on pizzas. On a chilly day, try this recipe for slow-cooked baked beans. If you aren’t around all day to watch them while they’re in the oven, try throwing the soaked beans and remaining ingredients into a crockpot, and come home at the end of a long workday to a warm, flavorful, and filling dinner. Soak beans in water overnight for at least 12 hours. Put beans and their soaking liquid into an ovenproof pot, bring to a boil, then turn to a simmer and cook on low for an hour. Add remaining ingredients, cover, and bake in a 325° oven for approximately four hours (adding more water if necessary, to keep beans moist but not too wet). Cook until beans are tender. Remove salt pork before serving.